It's hard to believe that we've been playing some form of a Neverwinter Nights game for nearly twenty years now, and it doesn't look like the multiplayer-friendly RPG franchise is going to be slowing down anytime soon. Keeping with tradition, the next installment will be developed by a studio new to the franchise (Cryptic Studios) and will be entirely based around a multiplayer environment - just as Stormfront Studios' original entry was. How long has Neverwinter been in development and what were your primary goals coming into the project? What was the reasoning behind dropping "Nights" from the title instead of using a subtitle? Jack: The possibility of Neverwinter came up when we were first talking to Atari about acquisition. We strongly believed in the future of user generated content and were actively working on a title at that point which featured it. It seemed natural that we'd change that title into Neverwinter. As for the title change, I think marketing made that call! Honestly, it makes sense. I'm a simple gamer guy. I like games that tell me precisely what the game is. Champions? It's a game about superheroes. Neverwinter? It's a game about the location Neverwinter. Ivan: What Jack said. Plus... I pitched Neverwinter as a title for a few reasons. First, I'm a huge fan of simplicity (I still believe DOOM is the absolute greatest title for a videogame, ever). I also didn't want online or some other superfluous differentiator included in the title (because those remind me of days when our industry embarrassingly bragged about "3D" and "Xtreme" every chance it got). Of course, there's also the R.A. Salvatore trilogy we had to think about. 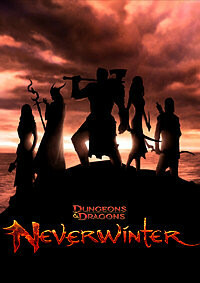 And, finally, our Neverwinter is not a direct sequel to Neverwinter Nights 2, so it made sense. In the preliminary information you've released, you mention AI-controlled allies. Is there a minimum party size required in order to tackle any of the game's quests? Or can a player take on most or even all content solo if they choose to? Jack: I'd like to emphasize that, while you can play solo, we're building the gameplay experience around party play (just like D&D 4e is), and henchmen fill the roles of missing friends in your party (so you can experience the cooperative aspects of the game etc.). Will our characters be saved locally or will they be on a closed server? If you choose to go the latter route, how do you intend to deal with player-created content that offers much greater experience and loot rewards than you'd like players to have access to? Jack: Everything is on the server; you need to be online to play. There's no offline play whatsoever. As for the rewards and the user generated content, that's something we talk about a lot internally. I know I don't want to create an abusable system, but at the same time, I want to make sure people have fun. As the game is focused on cooperative gameplay, can you give us an idea of how players will group up for an adventure? Are you implementing any specific community features that you feel will make the game stand out from a standard MMORPG and/or make it feel more like the tabletop experience while online? Jack: All missions should be joinable by your friends at any point for some reward, even if they've played it before and level should not be a barrier. We want to use the lobby ideas you see in FPS games so your friends can get moved physically to the mission you are on from the login screen so you don't have to wait for them. In order to attain their vision of a Dungeons & Dragons MMORPG, Turbine had to really shake up the D&D rules. Character hit points are in the thousands, spell points are used rather than a set number of spells per rest, enhancements were introduced, certain feats have been modified or taken out, etc. How strictly are you following the tabletop rules in Neverwinter? Are there any areas where some rule bending is more-or-less required? Jack: We're trying to be as faithful as possible to 4th edition, but WoTC has been great at stressing that the game needs to be fun. Not everything in the table top works well on a computer game, like the initiative roll. But a lot of it does translate very well. We've kept hit points within about 3x what you'd see in the table top game so I'm afraid you won't see things in the thousands! We also kept the idea of at-will, encounter and daily powers, though we've translate encounter to mean a minute or so and daily even longer.